In this Dharma Vanishing Era, Holy Ziguang Shang Shi, turns the wheel of dharma on the teachings of life and death and expounds supreme and profound Dharma for enlightening sentient beings of the current era in order to adapt to their need. The first volume of the Prajna Paramita Sutra of Life and Death was revealed on the Holy Mountain. It is a supremely brilliant sutra among the boundless Buddhist Dharma treasures, expounding the essence and beauty of the Dharma Realm, from the beginning of birth to the end of death. This Sutra is a summary of the Diamond Sutra, itself an abstract of the Surangama Sutra. The reason for living, the method for and the place of survival are depicted in a penetrating and thorough way. If the sentient beings with good affinity, with natural wisdom, understand and practice this Sutra, their greed, resentment and ignorance can be removed; their false thinking will be broken, and their attachments will be eliminated. The origin of birth and the cause of death will be seen clearly; thus their afflictions will be dispelled and their wisdom will expand. 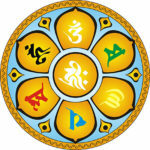 The Dharma of Life and Death is a great Dharma of enlightenment, a great Dharma of liberation. Thus the Sutra of Life and Death is an ultimate light, illuminating the path of life and death, and helping people cast aside attachment and attain liberation and enlightenment expeditiously.